Written by Mark Clayton, Senior Curator, Social History, Queensland Museum. 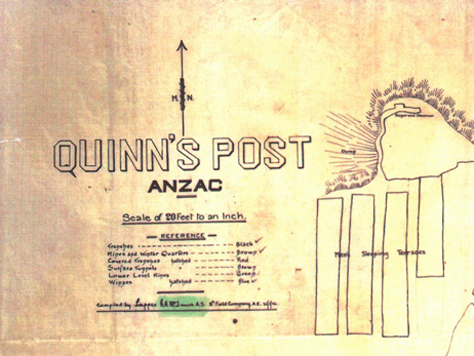 This hand-drawn map of Quinn’s Post, Gallipoli, documents – in great detail – the disposition of Australian forces including the location of mines, trenches, tunnels, and winzes. The right-hand table also chronicles the forty-seven mine explosions that occurred there during the eight month campaign. 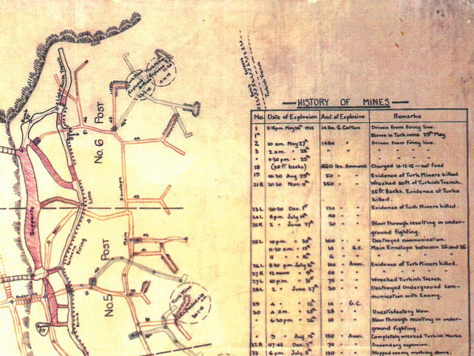 This remarkable document, drawn a month after the Australian evacuation in December 1915, is part of the McInnis collection of the Queensland Museum Network’s Lands, Surveying and Mapping Museum, which has donated the original to the Australian War Memorial. Top left hand detail of Quinn’s Post map. Scale of 20 feet to an inch. Reference reads: Trenches – Black. Mines and winter Quarters – Brown. Covered Trenches – hatched Red. Surface Tunnels – Brown. Lower Level Mines – Green. Winzes hatched – Blue. 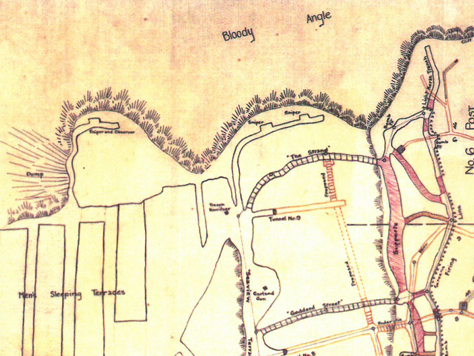 Map detail showing the Bloody Angle on the hills at Gallipoli & covered trenches highlighted with red hatching. Detail: right-hand table which chronicles the forty-seven mine explosions that occurred there during the eight month campaign. Table columns feature the following text: No, Date of Explosion, Amt. of Explosives, Remarks. We have reached our destination – Gallipoli –safely. I am in good health, the weather is lovely, we are well fed considering the conditions and our dug-out is assuming comfortable proportions. We had another visitation of Turkish shells this morning, just at breakfast time, and one poor fellow… was blown to pieces (20th September 2015). We wonder if we shall ever get away from this… foolish deadlock (4th December 2015). McInnis was fortunate though, surviving the horrors of both Gallipoli and the Western Front. Following the war he established himself as one of Queensland’s leading surveyors, serving variously as President of the Queensland Institute of Surveyors, and Brisbane City Town Planner. His progressive views on town planning were particularly well received in Tasmania where he finally worked, and retired. Discover more Queensland Stories, explore our WW1 collection online.